For this blog, even though we have already shared two of the speeches (Pranavadipa Vol. 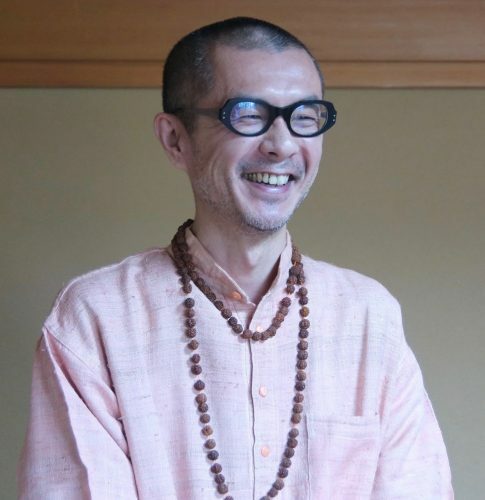 43) given by Shri Mahayogi’s disciples at Sanatana Dharma Avatara Mela (Ceremony of Divine Manifestations), which was celebrated this past April, we would now like to share the speech given by our brother, Sanatana, as well as the words he gave at the opening of the event. His speech was the last of all of the speeches given, and he mentions Swami Vivekananda, who greatly revered Buddha for the compassion he showed for others throughout his life and how his teachings changed the history of India. And finally, we would like to share the words imparted by Shri Mahayogi himself at the end of the ceremony. Truly it is a Strong Message for us all to take into our hearts. And Shri Mahayogi IS CURRENTLY HERE IN NEW YORK!!! HOW RARE AND PRECIOUS IT IS TO HAVE THE OPPORTUNITY TO LEARN AND RECEIVE GUIDANCE AND BLESSINGS DIRECTLY from a living Master, a Buddha!!! May many people meet Shri Mahayogi and may the grace of Shri Mahayogi’s physical presence inspire us to seek the teaching from him, and to strengthen our passion and faith to actually walk the path of Yoga by applying the teaching that will lead us to experience our true Self. Let us all celebrate this day together. Sanatana Dharma—originally, the words and meaning of Sanatana Dharma itself were introduced to the world when Buddha appeared and used “Sanatana” or “Dharma” to express the Eternal Truth. In India, these terms have been cherished throughout the ages and have thus been passed down to us. And what Buddha said: “I found the ancient path, that ancient straight road travelled by the Perfectly Enlightened Ones of long ago”—this he declared unequivocally. However, when we look carefully at Buddha himself and at his life, he himself did not have a master. He tested all the various methods available during his time, he practiced all of them perfectly and in quite an unprecedented, unsurpassable way, yet he was not satisfied with them, and so he followed his own convictions and grasped the Truth itself. That was his path to Satori. In India, it is considered that there are ten Avatara, ten incarnations of Vishnu, a universal God. Buddha was said to be the ninth existence. He himself had no master, nor was there even a path to be taught, yet he realized the Truth by himself. It looks to us as if Buddha himself brought that Truth. However, as I mentioned earlier, Buddha himself said, “This is not my creation. This is nothing coming from my thoughts or my analysis. Whether I am here or not, this Truth exists eternally.” In other words, “I found the ancient straight road.” That is what he said. From his words, we can see that this is not some lineage that is passed down through history or through an oral lore. Through his own practice and meditation, he felt the past Awakened Beings’, or the Buddhas’, Existence vividly and tangibly. I see that this is equivalent to how Shri Mahayogi began to practice asana on his own and mastered each and every one as if he had invented them himself, and then afterwards confirmed that it was something that has been passed down continuously as Yoga from ancient times in India—it was not something that he heard from someone else or was taught by someone else, but that he confirmed through his own intuition. We are taught meditation or asana in Yoga, and while we are putting this into practice for ourselves, we, at times, may feel the self-improvement, effort, and passion of the ancient yogi through a single asana or through the progression of the ways of meditation. And at times we feel that we too belong to the path of the yogi, even though we may only be at the very edge of it, and that we can practice Yoga because of the path taken by these ancient yogi. In this way, this succession of the Truth is not a mere physical thing, but rather it is the succession of the Soul of the yogi and of the buddha—those who feel It inherit It. I believe that is how it is. Today, there will be several people who will give speeches containing deep messages about Buddha or the Avatara and their seeking of the Truth. I think that these are nothing like merely introducing the life of Buddha or the holy beings, but rather, these are about how they themselves have felt the Buddha’s Soul and Essence, and have received His message, which they then deliver as their own message. I hope for today’s gathering to be about receiving and feeling the Buddha’s Soul and Essence. Thank you very much for this opportunity today. From the Editor: It would be most natural to insert all seven of the wonderful speeches here chronologically, but since we have already introduced two of these speeches in the Testimony of the current issue of Pranavadipa Vol. 43, we suggest that you re-read these two messages and then allow us to now introduce the speech given by Sanatana himself, who was the last to speak out of the seven speakers. Finally, and very gratefully, we would also like to share with you the precious words from Shri Mahayogi, who responded to everyone’s messages and spoke at the very end of Sanatana Dharma Avatara Mela. At other times, I suddenly thought that I wanted to be either somebody like Buddha or like Fudō Myō-ō (in Sanskrit: Achala or Vidyaraja; fierce protective deities, who take on a ferocious appearance in order to frighten away evil spirits and to destroy ignorance and ugly passions). I probably heard about the knowledge of this deity from a tour guide during a school trip to Kyoto (everyone laughs) when they were talking at Buddhist temples (Kiyomizu-dera or Kinkaku-ji), describing the various statues. Buddha looks like he is sitting in meditation, with a tranquil countenance, embodying kindness itself solidified into a human form, yet, I heard that within he is ablaze with the fire to realize the Truth; on the other hand, Fudō Myō-ō is considered to be a manifestation of Buddha, but his appearance is scary with his flaming exterior, and the reason he has a scary frown while stepping on a person is because his flames of wrath are for the purpose of removing people’s ignorance and pain-bearing obstacles. So then, I first thought, I want to be someone like Buddha or Fudō Myō-ō. However, I do not have a scary looking appearance to begin with (everyone laughs) so I thought I wanted to be more like Buddha. That is how I had been thinking about Buddha from the very beginning. Then, some years ago I had the opportunity to write a theatrical script about Buddha for an event the Mahayogi Mission was involved in. When I wrote the script, rather than simply writing things as they had happened, I wrote while ruminating on whether Buddha had intentions behind his words or not, and if he had them, what these intentions were, or if he said these words without intention, and so on. The story about Angulimala was the second theatrical script I wrote. When I read in the scriptures, there is only a mention of Buddha taking a brisk walk. But in order to write the script, I had to think about the motivation behind this action, and what he would be expressing as he walked. Therefore, I mused about whether Buddha intended to go to see Angulimala and then save him, or if he got lost in the forest without knowing; whether he knew the mind of Angulimala or whether he did not. I came to the conclusion that because he was a renunciate, there was no need whatsoever for him to be involved or to meddle with worldly troubles, gossip or confusion, or rather, he had to not be involved. Therefore, he must have had an attitude that the world should be taken care of by the world, and that would have been normal for someone in his position. However, he intentionally went to someone who was in the position of being the most despised person in the world, a serial killer, someone who had committed the worst crimes, and rather than even mediating between him and the world, Buddha made him his disciple. He must have seen through to the fact that all of the suffering of humanity was gathered in the suffering of Angulimala’s mind, and that the problem would not be resolved even if he were to be taken to the police—the pain-bearing obstacles within him were the same hatred and suffering that is within everyone, so unless this core issue were to be dealt with, the issue would not be resolved. He didn’t merely teach this or point it out, but he himself walked over to him with his own feet, invited this felon into his own sangha, and made him his disciple—if he were to do the same thing today, he would get the Internet blazing [with criticism]. (Everyone laughs.) I thought about this realistically. If Shri Mahayogi were to make a famous criminal into his disciple, our stance and our concern, or uneasiness, about this would be immeasurable. 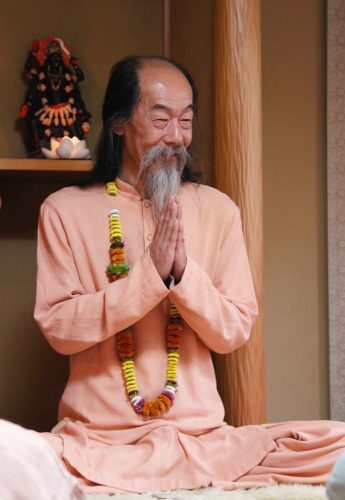 So, in the play, when Mr. Suzuki played Ananda, the closest disciple, his line was, “It will be a bad influence on the other disciples.”… As I wrote these words, I thought, Ananda is really saying something so obvious, in the most natural way that anyone would. In a way, Buddha is the far more daring one, doing something completely outside the box, beyond common sense. Why did he have to do such things? I suppose that Ananda must have been very far in his practice, yet he still might not have seen all of the mechanisms of the world, the suffering of Angulimala, or the root cause of all the people’s suffering. In that sense, even though Buddha was not obligated to do so at all, even though there were considerable risks of criticism towards him, and even though it might have led to the destruction of the sangha, or he might not have even considered such things at all, he just dove in and helped Angulimala. Here I see there is a concrete example that expressed the self-sacrifice of Buddha. Thinking about it now, I see that I tend to think quite seriously and keenly about these things that could easily be taken lightly as just a story, a fable, or a legend. But then I also notice that there is another person, who foolishly took these stories, that have now turned into legends and tales, with the utmost seriousness. That was Vivekananda. Towards the last years of Shri Ramakrishna’s life, young Vivekananda went to Buddha-Gaya with a brother disciple, Shivananda. 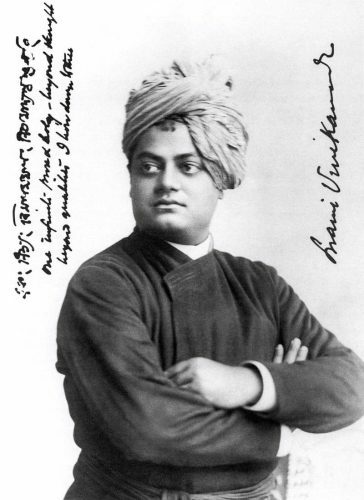 At that time, Vivekananda said that “he keenly felt the presence of Buddha and saw vividly how the history of India had been changed by his noble teachings; pondering all this he could not control his emotion,” and he then hugged Shivananda meditating next to him. To be accurate, this is not the story of Buddha. It is the story of King Shibi, a prior incarnation of Buddha. The story of King Shibi is also introduced in the Mahabharata, so it’s not Buddhism’s own, but it is a teaching that is familiar to Hindus as well. Naturally, Vivekananda must have known that this story was included in the Mahabharata. However, he said that this is Buddha’s essence. Vivekananda must have known very well that this was a legend or a tale, yet he took it quite seriously. He said that rather than the various words of Buddha, this tale itself is a very excellent teaching of Buddha, and he saw clearly and tangibly how this teaching changed the history of India. This self-sacrifice of Buddha—in other words, whether I can…(with tears) die for someone or not… That has been the question that continuously has captivated me since I began Yoga, and even before then. Buddha’s prior incarnations are filled with these stories. There are stories about his offering up everything, or surrendering his body to a hungry tiger, giving his own life for the life of this one single tiger. Or the story not unlike that of the hungry tiger who was in a devastating condition: the story of a six-tusked elephant. According to this legend, he gave his tusks to quite a greedy queen, the queen of Benares (Varanasi), and chose his own death. From such stories we can see his compassionate heart, where he didn’t even care about the motivation of others. Even though they are conveyed as the stories of his prior incarnations as bodhisattva, as you can see, the spirit of self-sacrifice, without taking himself into consideration at all, which is in the story of Angulimala, is not just a legend. It is the Soul of Buddha. I think that Vivekananda felt and awakened to that Soul of Buddha, and he walked the same path of life, as if possessed by it. He went beyond the life of a sannyasin who is not supposed to meddle in worldly matters, and instead, shortened his life for the sake of serving others. That was the life of Vivekananda. This matter has possessed me and it does not let me go. No matter what I say or what I know or don’t know, what tenets I follow or not, will I be able to sacrifice my life for someone else when I am called to? Will I be able to be a human being like that? That is the message that Buddha is asking of me. In a way, just like an ancient samurai, I feel like I have kept looking for a place to die, a battlefield where I can die. Just as our physical body is born, no matter what happens, it goes straight towards death, I think that our reincarnating souls are going straight towards the death of the ego. That is what I feel most from Buddha’s existence. There are words from Vivekananda that describe this precisely, and I would like to wrap this up by reading these words. Who was Buddha?—He forgave everything infinitely. Even though the words may have changed, what I initially thought since childhood in regards to him has not changed. He lived concretely. Regardless of the age or the location, I always feel that he was a live Existence. “Hearing the many precious speeches, my heart is overwhelmed. What many scriptures say, and also, the true identity of the Soul that dwells deep within everyone’s hearts, is the Truth. It is what is True. (Emphasizing) Only That exists as the one True Reality. There is nothing else other than that. At the same time, that One without a second, manifests across countless forms of things, of beings and of this universe. That is all. It is really simple. So, see only That, act only through That, and live only by That. There is nothing else. That’s It. Buddha and Shri Ramakrishna, they all found that simple Truth, and taught It. How definitive and holy were their lives and the way they lived them! Let’s all live without reservation, without pretense, straightforwardly. The anecdote about Buddha walking seven steps as soon as he was born and declaring that only Atman is sacred across heaven and earth—“Above Earth and below heaven, I alone am the world honored one.”—This describes that very simple Truth. Jai! Sanatana Dharma Avatara! Jai! Satguru Shri Mahayogi Paramahansa Ki, Jai!